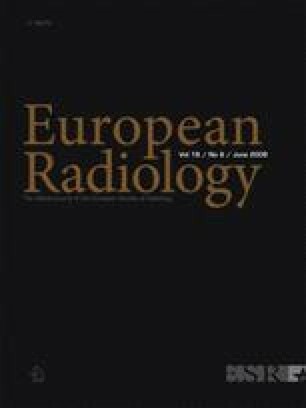 This study evaluated the safety and volume reduction of ultrasonography (US)-guided radiofrequency ablation (RFA) for benign thyroid nodules, and the factors affecting the results obtained. A total of 302 benign thyroid nodules in 236 euthyroid patients underwent RFA between June 2002 and January 2005. RFA was carried out using an internally cooled electrode under local anesthesia. The volume-reduction ratio (VRR) was assessed by US and safety was determined by observing the complications during the follow-up period (1–41 months). The correlation between the VRR and several factors (patient age, volume and composition of the index nodule) was evaluated. The volume of index nodules was 0.11–95.61 ml (mean, 6.13 ± 9.59 ml). After ablation, the volume of index nodules decreased to 0.00–26.07 ml (mean, 1.12 ± 2.92 ml) and the VRR was 12.52–100% (mean, 84.11 ± 14.93%) at the last follow-up. A VRR greater than 50% was observed in 91.06% of nodules, and 27.81% of index nodules disappeared. The complications encountered were pain, hematoma and transient voice changes. In conclusion, RFA is a safe modality effective at reducing volume in benign thyroid nodules.